The BMW – a status symbol for upper/middle management. It’s reliable, expensive and incredibly dull. 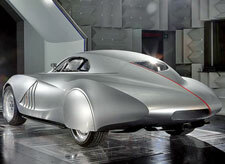 So imagine our surprise when we hear the German firm has thrown together a retro-styled sports car. 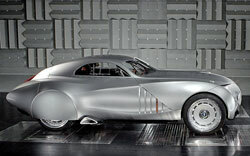 This is BMW’s new Concept Coupe Mille Miglia, which draws heavily for inspiration on the firm’s 1930s 328 racers. Underneath all those aerodynamic curves made from carbon fibre (to reduce weight) is a modified Z4 M coupe, complete with 343bhp and 3.2-litre six-cylinder engine. There’s no doors, the entire roof section opens for access, the car has a side exhaust and headlights that sit on (not in) the bodywork, incorporating the latest LED technology. 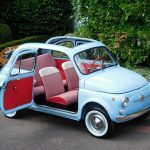 The Concept Coupe was unveiled at the start of the classic Mille Miglia race in Italy and is likely to make an appearance at the Goodwood Festival of Speed in July. However, as a concept car, it’s unlikely to make an appearance at your local showroom. Shame.